Algeria, Morocco, Switzerland, Belgium, Luxembourg & France are where most visitors come from. 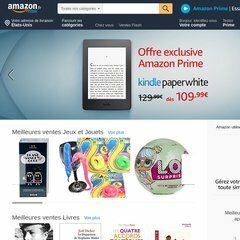 Topics: Amazon, Chez Vous, Promotions, ChÃ¨ques-cadeaux, Vendre, and Aide. amazon.fr English Phonetics and Phonology: A Practical Course/Student&apos;s ..
amazon.fr Hinterland: Caribbean Poetry from the West Indies and Britain ..
amazon.fr Nursing Theorists and Their Work: Amazon.fr: Martha Raile Alligood ..
amazon.fr Pediatric Neurosurgery: Theoretical Principles: Art of Surgical ..
amazon.fr Collapse: How Societies Choose to Fail or Succeed: Amazon.fr .. The site has about 550,602 users daily, viewing on average 8.09 pages each. It has 9 nameservers, including ns3.p31.dynect.net, pdns5.ultradns.info, and ns2.p31.dynect.net. Amazon.fr's IP address is 87.238.86.122. It is hosted by Amazon Data Services Ireland Dub Datacentre Dublin, using Server web server. Its server speed is measured at 1418 milliseconds.